After spending a week and more than five hundred miles with a 2008 Honda Civic Hybrid, we walked away thoroughly impressed. Although rated at 40 city / 45 highway miles per gallon (MPG), we were able to easily exceed those numbers, landing 46.2 MPG combined. Vanquish the thoughts of the tiny lightweight high-MPG Civics of yore (youth) … The roomy 2008 Civic has grown into adulthood and the Hybrid sits proudly at the top of the range. The Civic Hybrid is an ideal commuter’s car, achieving its best mileage out on the highway, unlike the Prius, Altima Hybrid, and Camry Hybrid, which deliver better mileage in the the city. The purpose of the electric motor in Honda’s Integrated Motor Assist (IMA) system is to to provide oomph under acceleration. While the Civic Hybrid shuts its gasoline engine down at stoplights (like its competitors), it does not have the ability to crawl away from a stop and around town solely under electric propulsion. 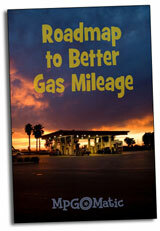 As with any vehicle, an investment of time is required to learn how to achieve the best fuel economy. The uncluttered gauges in the Civic Hybrid make that learning curve short. While lacking a big fancy animated LCD screen, the digital MPG and Assist/Charge gauges provide instant feedback. Honda decided to forgo the cartoon for the sake of simplicity, to good effect. The cockpit is cleanly designed, with a touch of whimsy in the fabrics. It’s a friendly spaceship. The dashboard display is clearly wrapped around the driver, using a two-level scheme that curves the gauges around the steering wheel. With the digital speedometer and MPG gauge just below the windshield, you’ll be able to keep your eyes on the road while monitoring your fuel efficiency. The Civic Hybrid doesn’t look like a hybrid. While the interior is space age, the exterior offers few visual clues to its hybrid soul. I checked out several vehicles, decided on the Hybrid Civic because of the reputation, gas mileage, and built in the USA, which several of the competitors cannot tout. Hey….I thought the 08 Honda Civic Hybrid was purely made in Japan..not the USA? I have had my civic hybrid for 2 wks., and under city/hwy conditions, I am only averaging 30.2 mpg. I have been told that I will not obtain the 40 mpg promised until I have driven it for approx 6,000 miles. I have not seen any info about this in any material about this car. At this time, I am sorry I did not purchase a Prius. Have had my 08 Civic Hybrid for 4 days. Car is awesome. I am getting 42-43 mpg with mixed driving. Thanks for the pointers on this website. Gave me an idea how to drive it. As long as you drive it with light acceleration you should be getting at least 40 mpg. I’ve owned the 08 Civic Hybrid for 3 weeks. I enjoy it everytime and never once regret. I have been getting 45.7mpg mixed driving. I love the looks especially its interior arrangement and ergonomic. the ride is quiet, nimble, and fun. Update on gas mileage.I have learned to drive the car for better gas mileage and have improved to 51mpg city.I use the cruise control a lot.Especially on hills.Finally was able to get the car to glide.Figured out how to get the car to shut the injectors off and glide in electric.Car is awesome!! I have a 2008 Civic hybrid. 8000 miles now. When new it got about 34mpg to 39mpg. After 3000 miles I took it on a long trip about 200 mi each way. It then got 46mpg and has averaged about 47mpg city/hwy ever since. I love it. My only wish is a plug in option. I have had a civic hybrid for about a month – on the fourth tank of gas and have driven 955 miles – I drive between 5 and 40 miles a day mostly in the city – I am disgusted – if driving this car takes a genius to get the advertised mileage Honda should have put that in the literature – today my MPG dropped to 24.3 – why pay extra for a hybrid . I say if you want 40 mpg buy a Prius. @jalice – I had no problem getting the advertised mileage out of the Civic. When you have a chance, please take a look at this article. It’s as easy as learning when to take your foot completely off the gas pedal. Once you learn this simple driving technique, your MPG numbers will get back to where they should be. That having been said, because of the difference in the design of the hybrid systems, the Prius is more economical in town then the Civic Hybrid … when driven properly. I’ve had my 2009 Civic Hybrid about a month. I’ve employed the hypermiling tactics, and my dash gauges all indicate that I should be consistently getting 40+ mpg. Yet when I gas up I’m averaging 25 MPG. Not at all impressed. @Mike – The folks at http://www.cleanmpg.com/ might have some ideas for you … they’re the champs at getting the maximum mileage out of the Civic Hybrid. Hey for the people who own the Civic Hybrid…..how is the power of this car in real world? By this I mean, does it constantly just rev and rev to get to 35mph, or do it with relative ease? I love this car and the idea of hybrid technology in general but since the Civic Hybrid has a 1.5 (if im not mistaken) it might be a bit underpowered? Maybe thats just me but anyone who has driven one or has one, PLEASE comment about the power especially up hills and general acceleration ability. P.S. Does the ride seem quite compared to other cars you can compare this to? My 2008 Civic Hybrid could get up to 50MPG on the highway, just by keeping the speed down to 50-55 MPH. I say could because it no longer is able to do that because the battery is aging. Nowadays when I let it sit a few days the IMA battery (the High Voltage one) drains away on it’s own, so that every time I go to start the car it relies on the little 12V battery to crank the motor with the little starter motor, rather than the large traction motor. It’s nice that there is a backup starting system, but having to use the backup every time is scary. I’m lucky if I can get 35MPG around town these days, what with the dead IMA battery needing to be charged up for the first few miles every time I drive it. Highway MPG is sometimes as low as 40MPG when I keep up with traffic, maybe a little more if traffic is light, 42MPG right now, after a few 100 mile trips.